A dozen of CityLab's favorite stories from the 2014 series on how Americans will travel tomorrow. 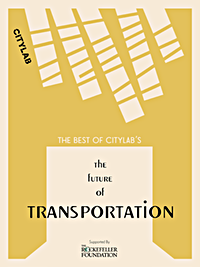 Whether you miss last year's Future of Transportation series or just plain missed it (for shame! ), you're in luck. We've compiled a dozen of our favorite pieces into an e-book now available for download. And thanks to the continued support of the Rockefeller Foundation, it's available for free. Our selections include three feature stories from the commuting section of the series (including my thrillingly tame adventure in Google's driverless car), three on sustainability (including Nate Berg's not-so-tame adventure in a Tesla), and three on design (including Brian Libby's look at why Portland is building a bridge that bans cars—a reader favorite). We round out the book with three of the best columns from the series on transportation policy. While it was impossible to choose every great piece, these pieces reflect both the geographic and multimodal reach of the series, taking readers across the country on roads, rails, and runways. Once again we thank the Rockefeller Foundation for helping us make it available to you—again, for free. (Did we mention it's free?) And you can always revisit your own favorites from the series, as originally published, here. This PDF is viewable on iPad and Kindle. To view this PDF on your iPad, simply open in your browser or iBooks. To view this PDF on your Kindle, please consult the user’s guide for your specific Kindle model. For 2nd Generation devices, you can send PDF documents directly to your device via your Send-to-Kindle address, or you can drag and drop PDF files from your computer to your device via USB.